79. “The morns are meeker than they were.” Dickinson, Emily. 1924. Complete Poems. 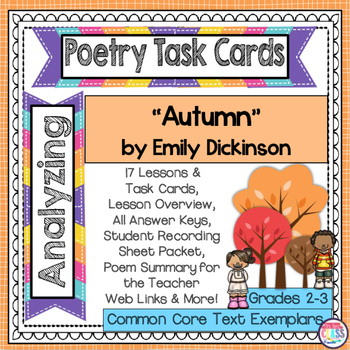 This is a set of poetry analysis close reading task cards and other materials to teach the poem, "Autumn" by Emily Dickinson. This poem is on the the CCSS-ELA text exemplar list for Grades 2-3. The set gives you 15 task cards and all of the student and teacher. Instruction regarding figurative/nonliteral language (similes, metaphors, personification) must be explicitly taught, as well, through the reading & analysis of various texts containing nonliteral language, ... In this activity, gifted learners would work either individually or with a partner to close read “Autumn” by Emily Dickinson.